Finding the right gear is hard. Finding the right gear that’s perfect for you? Even harder. We asked our skaters to write about their favorite gear in hopes of making everyone’s search a little easier. 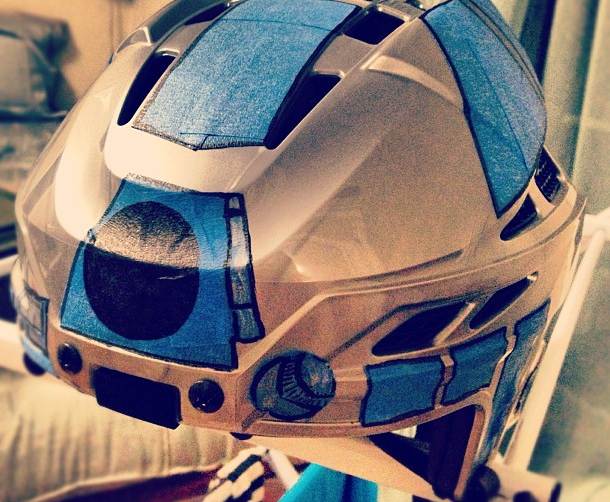 Our first Gear Check: Artoo Detoonate talks about her very-distinctive (and protective) M11 hockey helmet. While I may not compose many lyrical sonnets while dodging blockers on the track, when the gear is off, I’m a writer by trade. My brain is my most important instrument, and I can’t risk hurting it when I play roller derby. That’s why I switched to an M11 hockey helmet last year—and boy, am I thankful I did. When I moved to Boston, I switched from playing on somewhat bouncy sport court to stony, unforgiving concrete. Rationally, I knew that smashing my head against sport court would probably hurt as much as doing so on a stone floor, but it was that concrete—and seeing a few nasty concussions—that pushed me toward the hockey helmet realm. In comparison to the typical skateboard helmet found in derby, hockey helmets are expensive. But when you look at the comparison in protection, there’s no question which one is better. Windy City did a great study a few years ago on the types of helmets found in regular derby play, and recommended unequivocally that skaters purchase hockey helmets going forward. Concussions and brain damage are no joke when you’re playing a full-contact sport. On your head, the M11 feels odd if you’re used to Triple 8s. I was sure that it sat much higher up on both my forehead and the nape of my neck; it didn’t, but if you’re not used to a hard foam interior (as I wasn’t), it sure seems that way. The fit customization is much better than your average Triple 8, though, as you can tighten the helmet’s fit around the back of your head and under your chin. Playing, you won’t feel all that different (aside from being a little sweatier)—until you get knocked in the head. That’s when having the M11 makes all the difference. A week after getting myself my own M11, I was knocked down with such a force that my entire body was flung onto the ground—and then my head was accidentally slammed to the ground by an opposing player as she fell. Now, smacking your head against concrete isn’t ever going to feel good, and I won’t lie by saying that it did. But I was able to get up off that floor without even feeling dizzy. And my brand-new helmet had nary a crack or a scuff. I don’t think I could have said that had I been wearing my old helmet. The M11 isn’t perfect. I still have to take it off sometimes in-between drills and readjust the back—if you play in a hot environment, the hard foam can occasionally feel like it’s compressing against your skull. And obviously, no helmet can save you a hundred percent from a concussion. But it’s the helmet for me, and I can’t recommend it enough. Posted in Gear Check, News and tagged artoo detoonate, gear check, m11 hockey helmet, roller derby. Bookmark the permalink.